Tracks Currently Racing: Belmont Park, Saratoga, Aqueduct, Monmouth Park, Laurel, Penn National, Pimlico, PARX (Philadelphia Park), etc. Why own a racehorse with Drawing Away Racing Stable? It's fun, easy and affordable. Drawing Away Stable allows you to know and control the amount that you are interested in or able to invest. With our “no expenses ever" concept there are never any additional expenses, so your investment is known and controlled. Where will the horse I buy race? Drawing Away Stable is a New York based operation racing primarily on the NYRA (Belmont, Saratoga, Aqueduct) circuit. However, we will ship horses to tracks such as Laurel, Monmouth, etc., to win races when appropriate. Visit us at our website http://www.drawingawaystable.com for detailed information, photos, announcements and updates etc Visit and join our Facebook page http://www.facebook.com/DrawingAwayStable for photos, videos, announcements, updates etc. 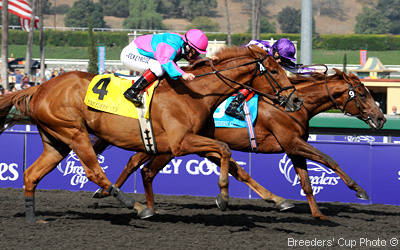 Royal Albert Hall (GB) Gelding $91,570 Stakes winner Bernardini S.
Daria's Angel Filly $134,947 Winner Sis City S.